Photograph above by Marko Riikonen on 1st June 2008. A noteworthy streak of pyramid crystal halos in Europe started with a display on 27th May in Stavanger, Norway, where two Hungarian observers took photos in the evening: András Uhrin ( 1 - 2 ) and Éva Bora ( 3 - 4 ). Their photos show 9° halo, 18° halo, 18° plate arcs and a hint of an upper 23° plate arc. 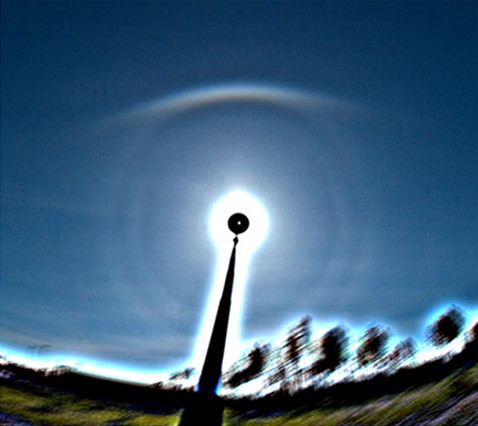 Next day, on 28th May, Jarmo Moilanen captured a subhelic arc in Oulu, Finland ( 5 ). Meantime in Kokkola, Finland, the odd-radius halo streak was marginally kept alive by a short-lived appearence of 9° halo ( 6 ). On 30th May in Turku, Finland, observers were alert in the afternoon. 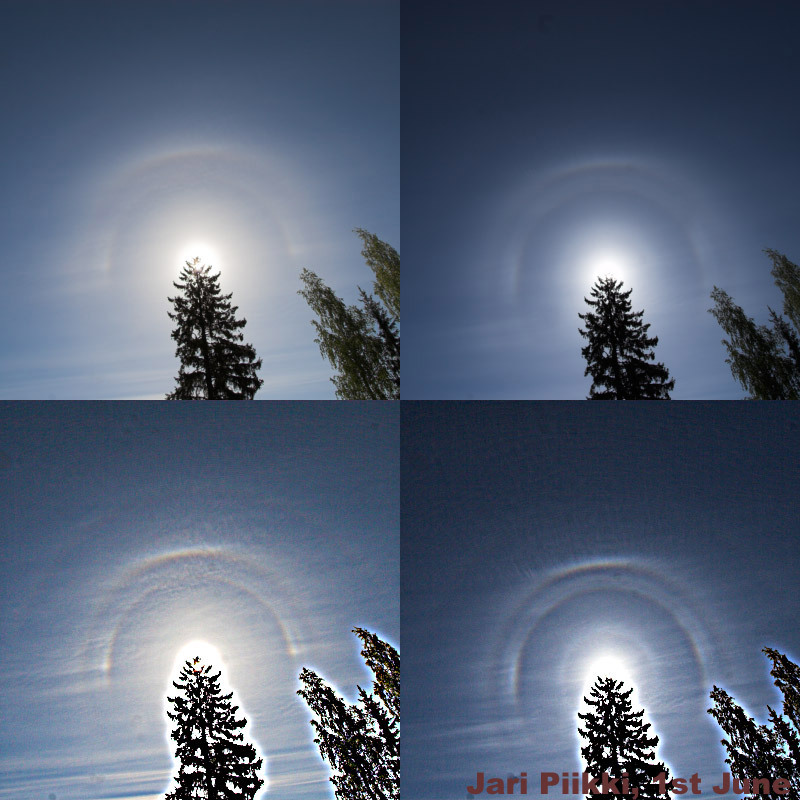 The 23° upper plate arc and halo rings with radii of 9°, 18°, 20° and 23° were photographed by Joni Tahkoniemi ( 7 ) and Pertti Havia ( 8 ). A one day gap between pyramid crystal displays occured on 31st May, when as consolation a faint display with a long parhelic circle was seen in Riihimäki ( 9 ). The morning of 1st June kept observers busy in Southern Finland. At around nine a.m. a very classy 23° upper plate arc was observed by Reima Eresmaa in Lammi, Jukka Ruoskanen in Riihimäki ( 10 ) and Marko Riikonen in Vantaa ( 11 ). Faint 18° plate arcs were in the sky as well. Later on photographs revealed also 20° and 23° halos. Marko was most alert, and was able to catch the maximum of the display. 9° and 35° halos and the pyramid helic arc appear in his photos. The pyramid helic arc was to be expected to show up because of the quality of the 23° upper plate arc. For further information see Marko's comments below the photos in his gallery. Few moments after the maximum stage in Lammi, Riihimäki and Vantaa the halos striked Juva, where Jari Piikki photographed a magnificient set of pyramid crystal halos ( 12 ). Most distict features in Jari's photos are strong 20° and 35° halos. 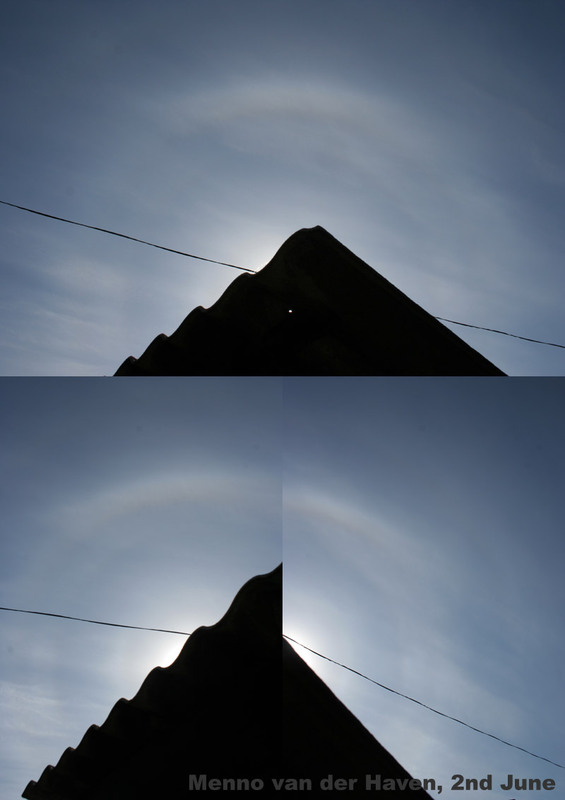 Next morning, on 2nd June, Menno van der Haven photographed a pyramid crystal halo in Curteni, Romania ( 13 ). The display is very similar to Jari Piikki's display the day before, except that the 23° upper plate arc is a bit stronger and the 20° halo is weaker. 35° halo is of the same caliber. I like Jukka's photos showing all 8 halos at once now thats what I call a lot of rings around the sun. What's missing from Parry's drawing?